At Key North Productions, we work closely with each client, providing tailored copywriting, voice recording and media consulting services, to ensure each commercial meets the unique goals and needs of your company. Click to read more about each service. We are a full service radio advertising agency. We specialize in Public Service Announcements (PSAs) and also provide straight advertising for clients promoting specific products and/or services. Your commercial will be born from your business model; our team of professionals will work with you from concept through design to ensure delivery of the finished product... a professional “On Air” advertisement. We handle all aspects of your advertising campaign from copywriting to voice production and scheduling. Listen to our voice-over artists and commercial samples… they speak for themselves. We have some of the best voice-over talent in the industry, featuring both male and female voices as well as character voices. 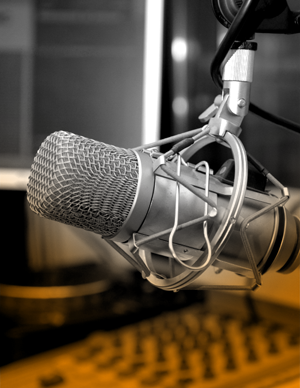 Our pool of Voice Artists have years of experience in the radio production industry and are currently “on air” in every major market in Canada and the United States, from Vancouver to St. John’s and New York to Los Angeles. Our Scheduling department handles all aspects of your radio campaign, ensuring the best available times suitable for each individual client and their respective demographic target market. Key North’s coverage map outlines more than 21 radio stations throughout Southern Ontario, including stations in Winnipeg and Calgary. Formats range from Jazz to Talk Radio, including Sports, Top 40 Hits, Easy Listening, Country, Christian Hits, Family Radio, Soft Rock, and Adult Contemporary. We are confident we can provide your business with a format that suits your advertising objectives and goals. Sales pricing and broadcast packaging strategies. Corporate Branding and Image development. Strategic Demographic and Geographic scheduling. Blending radio, television and print. Target market evaluations and competition strategies. Budget planning and contract negotiations. "On Air" creative and sound bedding. Key North will seamlessly handle all aspects of your radio campaign from strategic marketing to full production and scheduling. Other agencies are either buyers or creators of Radio Media. At Key North we handle the entire aspect of radio advertising from conception to the final “On Air” product. Radio advertising has never been easier with the full service Media Solutions Key North provides for your business. Contact one of our Marketing specialists today.